INDUSTRY.co.id - Cikarang, After gaining success in the first stage, Jababeka Residence in collaboration with Japanese developers, Creed today re-launched Kawana Golf Residence phase two. 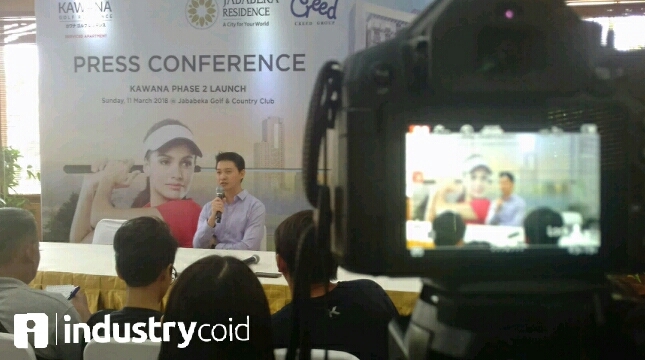 President Director of PT Graha Buana Cikarang Sutedja S. Darmono said, seeing the interest and demand of investors is high enough to make the company again launched Kawana Golf Residence phase two. "Seeing the enormous response from buyers, we re-open the opportunity to potential investors to buy Kawana Golf Residence Phase two," said Sutedja keada media crew in the launching event Kawana Golf Residence in Cikarang, Sunday (11/3/2018). Kawana Golf Residence the second stage, according to Sutedja, carrying the theme of International Modern Japanese Standard, this theme is not only to attract expatriates from Japan. However, as well as to accommodate other expatriates. "Currently Cikarang has become the destination of international expatriates, so not only Japan there Korea, Taiwan, China, Europe and America," he explained. Sutedja said Japan's current standards have been accepted and made sense for everyone. "When viewed in Asia, the Japanese standard is the highest, therefore we choose the concept with the Japanese standard," said Sutedja. Furthermore, he said, for this second stage there is no difference with the first stage. According to him, this second phase only continued the sale of the first phase of the highly successful. As is known, the Grand Launching Kawana Golf Residence first stage in December 2017 then managed oversold, where from the initial target of sales of 6 floors, at the end of December Jababeka Residence managed to sell 10 floors. "Our first phase sales oversold, while for the second stage until 13:00 pm already 95%, our target today sold out" he explained. Speaking of price increases, he added, Kawana Golf Residence recorded a significant price increase. Until now, the price increase has reached 5-10%. "Currently, the price is Rp 33 million per square meter and this is a new benchmark of property in East Jakarta," said Sutedja. Please note, Kawana Golf Residence is the first and only apartment in Indonesia that has direct access to golf from the apartment lobby, which is the most important point that distinguishes this apartment with other apartments in Cikarang and its surroundings.